. The homestead of every family, whether owned by the husband or wife, is exempt from judicial sale, where there is no special declaration of statute to the current contrary. (10150). A widow or widower, though without children, shall be deemed a family, while continuing to occupy the homestead at the death of husband or wife. (10151). Upon the death of either husband or wife, the survivor may continue to possess and occupy the whole homestead until it is otherwise disposed of according to law, but the settling off of the distributive share of the husband or wife in the real estate of the deceased shall be such a disposal of the homestead as is herein contemplated. (10145). The survivor may elect to retain the homestead for life in lieu of such share in the real estate of the deceased. (10146). No conveyance or encumbrance of, or contract to convey or encumber homestead, if owner is married, is valid, unless husband and wife, join in execution of same joint instrument, whether homestead is exclusively the subject of the contract or not. (10147). Subject to the rights of the surviving husband or wife, the homestead may be devised like other real estate of the testator. (10148). Neither husband nor wife can remove the other, nor the children from the homestead without consent of the other. (10149). Where the homestead descends to the issue of either husband or wife, the same shall be held by such issue exempt from any antecedent debts of their parents or their own, except those of the owner thereof contracted prior to its acquisition. (10153). Where there has been a change in the limits of the homestead, or a new homestead has been acquired with proceeds of old, the new homestead, to the extent and value of the old is exempt from execution in all cases where the old or former one would have been. (10154). 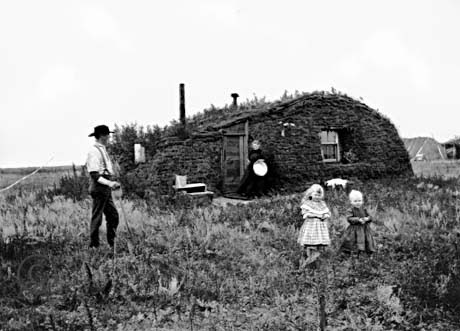 The homestead may be sold to satisfy debts of each of the following classes: (1) Those contracted prior to its acquisition, but then only to satisfy a deficiency remaining after exhausting the other property of debtor liable to execution. (2) Those created by written contract by persons having the power to convey, expressly stipulating that it shall be liable, but then only for a deficiency remaining after exhausting all other property pledged by the same contract for payment of debt. (3) Those occurred for work done or material furnished exclusively for the improvement of homestead. (4) If there is no survivor or issue, for the payment of any debts to which it might at that time be subjected if it had never been held as a homestead. (10155). Bonner, Judge W. G. Handbook of the Iowa Probate Laws, 1930. Des Moines: Hawkeye Cornhusker Department, 1930.